Friday, July 27: Many more wildflowers are coming into bloom in the prairie. Virginia Mountain Mint Pycnanthemum virginianum, Gray-headed Coneflower Ratibida pinnata, Bergamot Monarda fistulosa, Culver's root Veronicastrum virginicum, Flowering Spurge Euphorbia collorata, Showy Tick-trefoil, Desmodium canadense, Dense Blazing Stars Liatris spicata, and Tall Ironweeds Vernonia missurica are conspicuous along trails through the nature reserve. The first Northern True Katydids (Pterophylla camellifolia) were heard on the evening of July 22. Their loud, distinctive "katy did, katy didn't" song is common over much of the Northeastern US. In Ontario they can be heard only in the Carolinian region. This is the start of the flight season for underwing moths. Ilia, Woody and Ultronia Underwings are some of the first species to appear in July. Wednesday, July 18: Paul Pratt discovered a new damselfly for Canada last week. Lilypad Fork-tailswere found in the extensive water lily beds of the Point Pelee marsh. Since this species seldom strays from large beds of Nuphar and Nymphaea it may be well established at Pelee but overlooked in the past. Sunday, July 8: Male dog-day cicadas (Tibicen sp. )have just started singing their loud, buzzing songs. Dog-day cicadas are about 5 cm long with dark, greenish marked bodies and clear wings. Females lay their eggs in the twigs of trees but when the nymphs hatch they fall to the ground, and enter the soil where they remain for many years. Saturday, July 7: The Windsor Butterfly Count recorded 55 species of butterflies today. Highlights included a record 30 Baltimore Checkerspots (previous high was 3), 83 Red Admirals and twenty species of skippers. Visit the butterfly count page for the complete results. Tuesday, July 3: Fall migration is well underway at several local wetlands. Extensive mudflats at Hillman Marsh C.A. and Big Creek (Holiday Beach C.A.) are attracting good numbers of migrant shorebirds. Yesterday at Holiday Beach Paul Pratt found a single flock of 160 Lesser Yellowlegs and two Short-billed Dowitchers (still in nice breeding plumage). An early Red-breasted Nuthatch was found near the park entrance while Great Egrets (130 in just one bay!) and Great Blue Herons were present in large numbers. 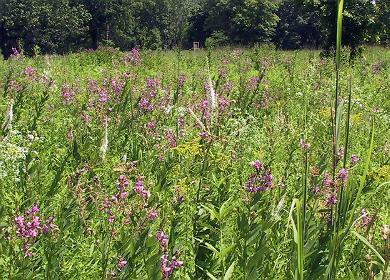 Some typical tallgrass prairie wildflowers blooming this week include Ohio Spiderwort, Butterfly Milkweed (at peak of bloom), Purple Milkweed (nearing end of flowering period), Ragged-fringed Orchid, Black-eyed Susan, Flowering Spurge and Meadow Lobelia.